Brian Michael Bendis and Michael Avon Oeming’s Powers has had four different first issues since its creation in 2000, and next week it gains another one, as the two creators relaunch their superhero crime series to coincide with the premiere of the new Powers TV show on Sony’s PlayStation Network. 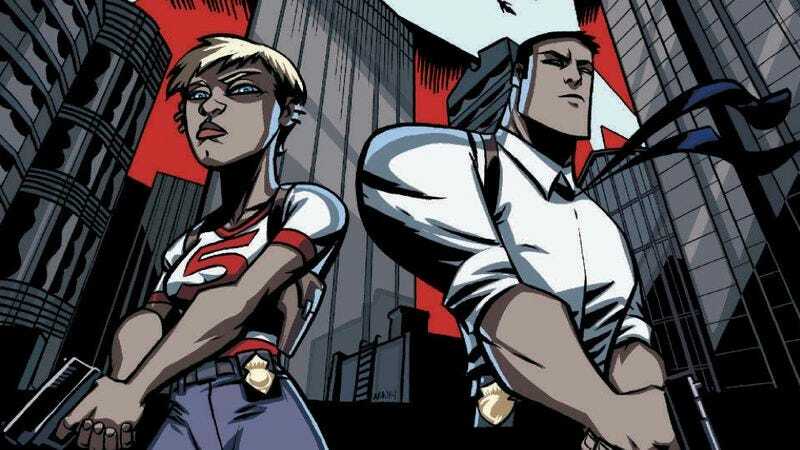 After a brief stint working for the FBI, detectives Christian Walker and Deena Pilgrim are back on the powers homicide beat, investigating murders involving superpowered victims and perpetrators with the help of fellow detective Enki Sunrise. The book’s status quo may have changed considerably over the past 15 years, but judging by this preview of next week’s Powers #1, the tone has not, as it continues to contrast light, banter-filled dialogue and cartoonish artwork with gritty police drama. The two-page spread of Pilgrim and Sunrise walking through the police department should feel very familiar to long-time Powers readers, indicating a back-to-basics approach after the curveballs of the last two volumes. The artwork by Oeming does exceptional work realizing the setting in vivid detailing, filling the office with powers-related propaganda and costumed civilians whose brightly colored clothing pops against the primarily gray environment. Oeming’s contributions to this series are essential, and it will be very interesting to see how the TV show translates this book’s stylized visuals for live action. Even if that Powers ends up being a disappointment, hopefully it will bring more people to Bendis and Oeming’s comic, which has retained its high quality after a decade and a half.